Doesn't each summer seemingly get hotter and hotter every year? 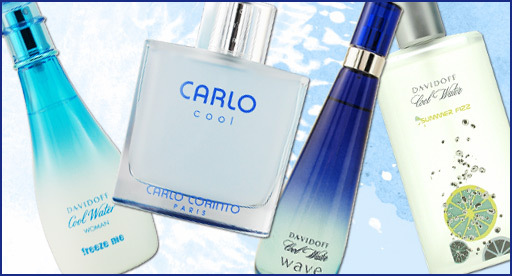 What better way to chill out than with cool scents, like Cool Water by Davidoff or Carlo Cool by Carlo Corinto? Carlo Cool is a citrus, fresh spicy, earthy scent with woody notes, a scent only the summer heat can handle. Cool Water by Davidoff is a popular fave, and with good reasoning! It comes in a men and women's scent and both feature a fresh, outdoorsy scent to keep you cool! A classic, to say the least! While we can't think of a better way than enjoying other scents by Davidoff, like Cool Water Wave or loving the scent of Cool Water Summer Fizz, we are always in the mood for an icy cool and refreshing scent...oh yeah, and who can't pass up an iced coffee? What cool scent is your summer must have during the heated, hot summer days?